Agriculture started thousands of years ago, but no one knows for sure how old it is. 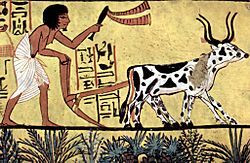 The development of farming gave rise to the Neolithic Revolution whereby people gave up nomadic hunting and settled in what became cities. Agriculture is not only growing food for people and animals, but also growing other things like flowers and nursery plants, manure or dung, animal hides (skins or furs), leather, animals, fungi, fibers (cotton, wool, hemp, and flax), biofuels , and drugs (biopharmaceuticals). 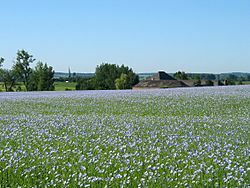 Many people still live by subsistence agriculture, on a small farm. 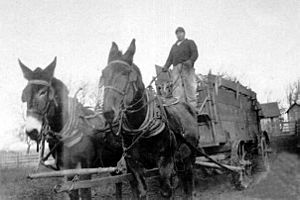 They can only grow enough food to feed the farmer, his family, and his animals. 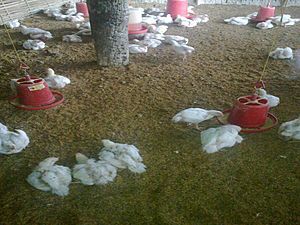 Extra food or animals are sold for money or other things the farmer cannot grow. 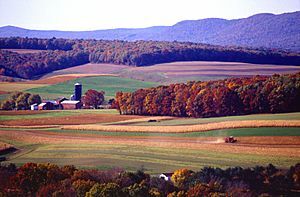 The yield is the amount of food grown on a given amount of land, and it is often low. This is because subsistence farmers are generally less educated, and they have less money to buy equipment. 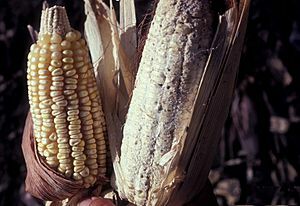 Drought and other problems sometimes cause famines. 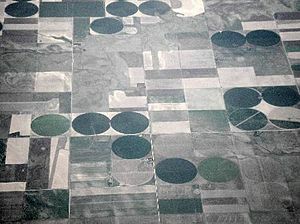 Where yields are low, forests are sometimes cut to provide new land to grow more food. This is good in the short term, but can be bad for the country and the surrounding environment over many years. 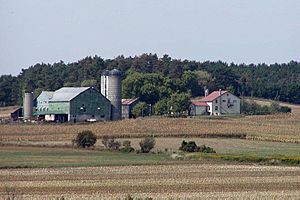 In rich countries, farms are often much larger. The amount produced on farms has got bigger in the last one hundred years because farmers are able to grow better varieties of plants, use more fertilizer, use more water, and more easily control weeds and pests. 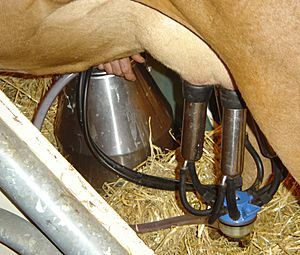 Many farms also use machines, which cut down on the number of people needed to farm the land. There are fewer farmers in rich countries, but the farmers are able to grow more. Food safety: to be sure that the food supply is safe. Food security: to be sure there is enough food for everyone. Food quality: to be sure the food is of good quality. Farming Facts for Kids. Kiddle Encyclopedia.